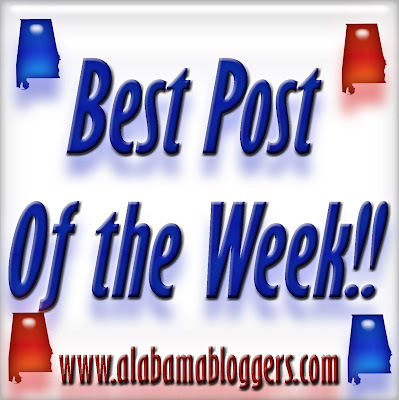 This was a terrible week for me in blogging - I only posted twice! I have got to do better. My post this week is about our Valentine's Day. I made a delicious and really easy fondue (recipe to come later - hopefully!). I posted about what I'm going to tell my Grandchildren one day about football...and Toomer's corner...and Alabama Civil War. This wasn't necessarily my "best" post, but the Christmas lights flasback is worth a few seconds of anyone's time. I posted about making my son's Valentine bags for his class + a quick tutorial on how to make a cute super-cheap/easy tie shirt for a little boy. 11. Wade on Birmingham - Fairhope native Krista Klumpp begins her season on "Survivor." Survivors ready? ... Go! 12. Magic City Post - Mardi Gras is coming back to Birmingham with a parade on Southside. 13. Birmingham Blogging Academy - I teach you how to be the best 5-minute speaker you can be. My post was simply about my joy in finding and photographing WWII planes and a live armadillo. I love it when my husband and I can find the time to get out and see this new place, Alabama, that we now call home! My whole blog site is about things that have happened in my life and I compare to my favorite show which is Desperate Housewives expecially Bree Van de Kamp (Marcia Cross). She is my favorite of the girls. My post is from the ABC Wednesday Meme, E for Exhibit, and I posted photos exhibiting Selma's spring pilgrimage of historic homes and sites. It's coming up this year March 18-19! For 10 years I was surrounded by models & actresses paid to be thin and super-humanly beautiful. Now I live in Birmingham & find women with the very same obsession, just no paycheck to go with it. They're "Hot in Birmingham." Blogger Spotlight: The Brooklyn Dodger.